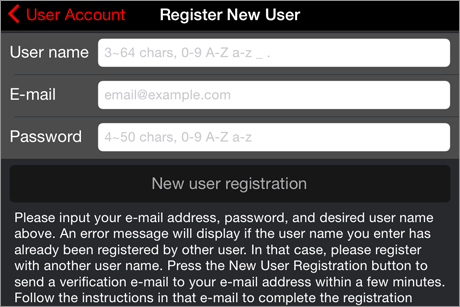 User registration will allow you to use the Pro version, which includes more convenient functions. Registration is free. We have prepared more benefits for our users in the future, so please make sure to register.Even if you do not register, you will have access to the main functions, so you can wait to proceed with your registration at your convenience. However, special rewards when upgrading the app may be limited only to users who were already registered before the release of the latest version, so we recommend registering early. 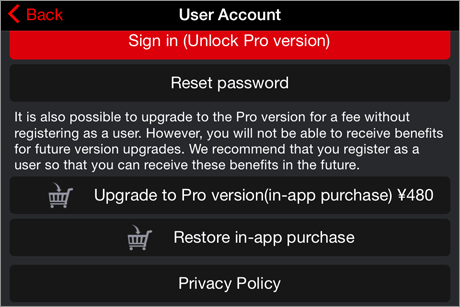 *[note] Even if you do not register as an user, you will be able to use the Pro version by unlocking functions through in-app purchases. We appreciate your understanding that, by doing this, you may not be eligible for some benefits in the future. 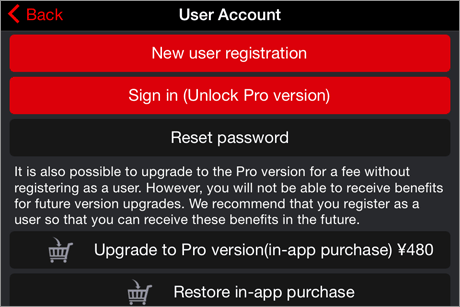 Even if you upgrade to the Pro version through in-app purchases (unlocking functions,) you will still be able to register as an user. On the contrary, you will be able to make in-app purchases even if you are a registered user. If you like mimiCopy and would like to continue to support us, please do make use of the in-app purchases. It is possible to use the same account even if you are using mimiCopy on more than one iOS device. The number of iOS devices that can sign in with the same account is limited. The maximum number has been set to allow a regular use range without problems. Please rest assured that any user information provided at the time of registration will not be transferred to a third party. Please contact us here if you have any questions regarding user registration. From the main screen, proceed to 'Settings’ -> ‘User Account’ -> ‘Sign in / Register,’ and open the ‘User Account’ page. On the next screen, tap on ‘New user registration’. 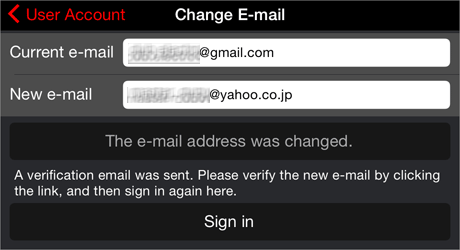 Enter the ‘User name’、’E-mail address’、’Password’ that you would like to register. The ‘User name’ may display an error if there is already another user with the same name. In this case, change it to a different name. Please note that the user name cannot be changed after the registration process is finalized. Please make sure that you enter an existing email address. 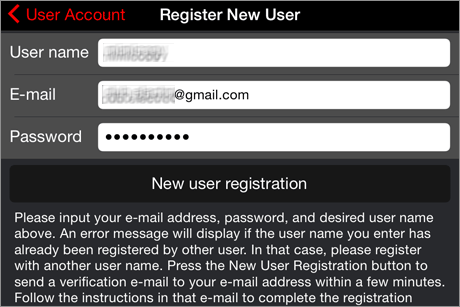 Once you have filled in all the required fields, tap on ‘New user registration’. After you tap, you will see the following screen. At this stage, your registration is provisional, which means it is not complete yet. You will not be able to use the Pro version until you formally finalize your registration, so please make sure to proceed until your registration is complete. Your registration will be complete after your email address is verified. A verification email will be sent to the email address that you registered. (The subject of the email will be "mimiCopy]Registration : Email address verification is required.") It may take a few minutes for you to receive the email. If you do not receive it, please check your "spam" or "junk mail" folder. If you still cannot find it, please contact us here. Please read the content of the verification email carefully, and open the link displayed in the email. When you open the link, the completion page will be displayed and your registration will be finalized. Once your registration is finalized, please return to mimiCopy and sign in. Tap either the ‘Sign in’ button at the bottom of the new registration screen, or the ‘Sign in (Unlock Pro version)’ that you will find by going to ‘Settings’ on your main screen, then ‘User Account,’ and then ‘Sing in / Register.’ Please have a look at this too for more information regarding signing in. You can use the Pro version when you are signed in. When you are signed in, you will see a screen display like the one below. [note] You will need access to a network in order to sign in. 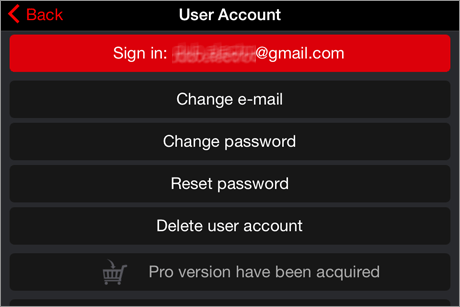 Once you are signed in, you will be able to continue to use the Pro version even when you are offline. From the main screen, proceed to ‘Settings’ -> ‘User Account’ -> ‘Sign in / Register,’ and open the ‘User Account’ page. Tap on ‘Sign in (Unlock Pro version)’ and proceed to the sign in screen. Enter your user name (or registered email address) in the ‘User name’ field, and your registered password in the ‘Password’ field, and tap on the ‘Sign In’ button. 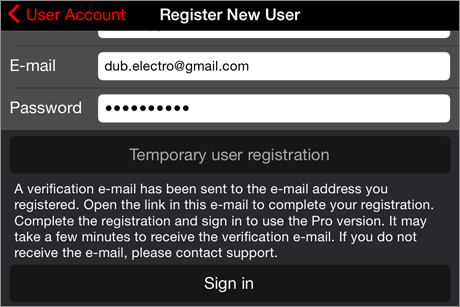 Once you are successfully signed in, you will be returned to the ‘User Account’ screen. This is what the screen will look like when you are signed in. Please note that you will not be able to sign in if you have not completed the email verification process following the link in the email we sent you when you first registered your account, as your registration will not be finalized in this case. You can sign out by tapping on the 'Signed in' button. Please note that you will not be able to use the Pro version if you are signed out. When you are signed in, a ‘Change password’ button will be displayed. The ‘Reset password’ option is displayed even when you are not signed in. You can reset your password if you have forgotten it. If you reset your password, a provisional password will be issued. Please use this password to sign in, and then tap on the ‘Change password’ button to change it to a different password. This is because the provisional password has a low safety level and there is a possibility that security problems might occur. 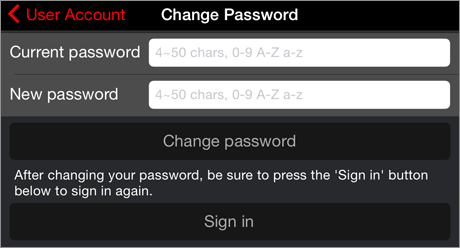 Tap on 'Change password' and enter your current and new password in the 'Change password' screen. Then tap on 'Change password'. Once the new password is registered, you will become able to tap on the 'Sign in' button at the bottom of the screen. Proceed to sign in. You can also sign in from the regular Sign in screen. 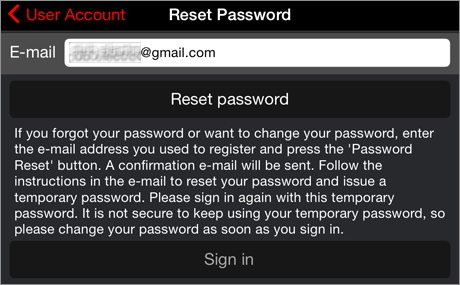 Tap on the ‘Reset password’ option in the User Account screen to go to the Reset screen. Enter your registered email address. An email with the steps to follow in order to reset your password will be sent to that email address. Follow the steps indicated in the email to reset your password and have a provisional password issued. You can only change your email address when you are signed in. 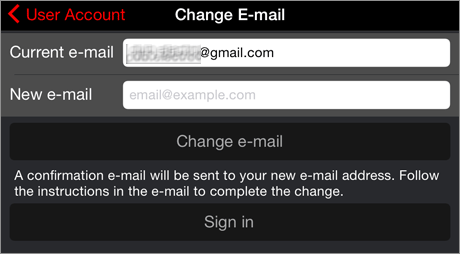 When you are signed in, the ‘Change e-mail’ button will be displayed. Tap on ‘Change e-mail’. A screen like the one below will open. Your current email address will already be entered. Enter the email address that you want to change to, and tap on ‘Change e-mail’. The button will read that ‘The e-mail address was changed’. However, you will need to complete the email verification process like when you first registered. A confirmation email will be sent to your new email address, so please follow the instructions to complete the verification process. Once your email address is verified, you will become able to sign in by tapping on the ‘Sign in’ button at the bottom of the screen. You will still be able to sign in before the new email address has been verified, but since the change will not be final yet, your old email address will be displayed when you are signed in. Please make sure to complete the verification process. 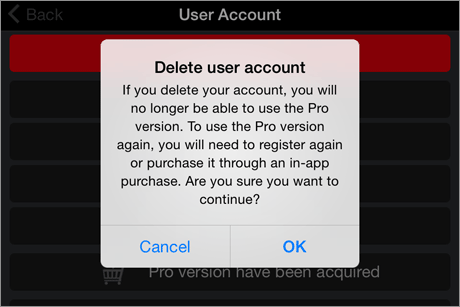 If you would like to stop using the app or to redo your user registration from scratch, you can delete your account. Please sign in in order to delete your account. Please note that you will still be able to use mimiCopy even if you delete your user account, but you will not be able to use the Pro version, and will not be eligible for future benefits any more. Tap on the ‘Delete User Account” button in the screen. A confirmation dialog will pop up. Read it carefully and tap on ‘OK’. If you would like to stop the deletion process, please tap on ‘Cancel’. By tapping on ‘Upgrade to Pro version’ and making your payment, functions will be unlocked and you will become able to use the Pro version. You can only make purchases when you are not signed in. Even if you are a registered user, if you would like to make a payment to support the development of our app, please sign out once, make your purchase, and then sign in again.